Cathedral of the Saviour (1808-1816) is a large five-domed cathedral with high five-level belfry and two-storey accretion for spiritual service built in style of classicism. At the end of XVI century a wooden church existed on this place. In 1684 stone church with side chapel was built in honour of the miracle-working Kazan icon of Mother of God. In 1780 when Elabuga became a district town, the cathedral did not accommodate all comers. That’s why in 1808 building of new cathedral at public cost started. In 1811 side chapels of Kazan-of the Virgin and of Michael-Archangel were sanctified, and in 1816 – main cathedral altar. Five-level belfry was erected just in 1835. 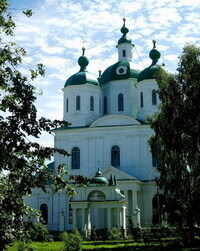 The old cathedral was demolished in 1820, and in 1877 on the place where it stood, a chapel was built in the name of the most Orthodox Prince St. Alexander Nevsky, and it remained till today. In 1855-1864 the cathedral was considerably rebuilt, and side chapels after the rebuilding were sanctified in the name of Archangel Michael and in honour of miracle-working icon of Mother of God “Consolation of All the Afflicted”. In 1864 refectory of the temple was widened to the west, and on place of former belfry a new one was built, connected with the refectory. This rebuilding (the last) was made on church people donations. In the same year a fretwork iconostasis was constructed by Arzamas master Korinskiy. Till present time interior decoration remained only fragmentary: carved cornices, pilasters with ornaments of Corinthian and Ionic orders, coloured floor of patterned tiles, iconostasis in style of rococo of delicate fretwork were lost. Among especially honoured icons of the Cathedral of the Saviour, the icon of Christ not made by hand found in the middle of XVIII century should be named. The cathedral is active, masses are held in it.